Her eyes lit up as she answered the question: What made you want to become a medical assistant? Petersen laughed as she told that story and revealed that nursing never interested her. 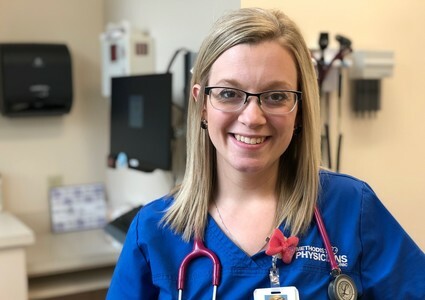 Petersen is a graduate of the Medical Assistant Program at Nebraska Methodist College, where there’s a heavy emphasis on patient care. Student outcomes for Methodist’s Medical Assistant Program are impressive. Petersen is part of the 94 percent of graduates who landed jobs within six months of finishing school. Petersen was required to sit for the American Association of Medical Assistants certification exam prior to graduation. It was this exam that gave her a CMA credential – something most employers prefer or even insist on before hiring a medical assistant. Petersen’s externship was at the internal medicine clinic at Methodist Physicians Clinic HealthWest. That’s where she now works – under Kris Story, APRN. Petersen believes her 300-plus clinic hours at NMC prepared her to begin work right away. From the start, she was tasked with a number of administrative and clinical duties. Petersen is fully aware of how important her role is. She’s one of the first people a patient sees during a visit. She’s also one of the last. And she firmly believes she’s a big part of patient experience. Working in internal medicine, Petersen sees a lot of older patients. “I love geriatrics,” she added. She treats every patient as if they were her grandmother. Petersen admits she’s had offers to work elsewhere. According to Franklin, that’s not uncommon. But for Petersen, leaving the patients she sees regularly would be too difficult. Even more difficult would be leaving the Methodist family.